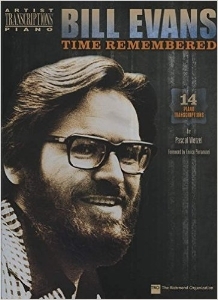 Five books of my work on Bill Evans's music have been released at this time in the U.S.A., three of them being devoted to his own compositions, following a first book of standards. (Special thanks to Judy Bell at TRO who gave me the opportunity to publish my transcriptions). 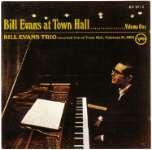 Epilogue ("Bill Evans At Town Hall", Feb.21, 1966) C.T. Fudgesickle Built For Four ("Loose Bloose", Aug.21-22, 1962) H.O. Interplay ("Interplay", July 16-17, 1962) H.O. Loose Bloose ("Loose Bloose", Aug.21-22, 1962) H.O. "C.T." for "complete transcription" , "H.O. for "head only". Here you will find almost every original he recorde . To get leadsheets as close as possible from the way he used to play the tune, I did a lot of listening, comparing and transcribing. I think I listened to no less than twelve versions of Waltz For Debby ! Bill's Belle: the first title was: "(Just A) Beginner in Love", with Lyric by Larry Coleman. CMinor Blues Chase Carnival: his longest tune, 80 measures. Catch The Wind: the first title was:"Get Yourself Another Fool" with lyric by Larry Coleman. Chromatic Tune: was probably written in 1966 It's Love It's Christmas: both words and music by Bill Evans, something rare ! Theme (What You Gave): probably written around 1978, and initially entitled: "Don't Count Your Dreams (Till They Come True). Waltz in Eb: probably written in 1966. With my performance notes for Prologue, Story line, Turn out The Stars, Epilogue, One For Helen, Who Can I Turn To.